I made a HUGE potential blunder today. I am a collector of Christian T-shirts and wear one almost every day. 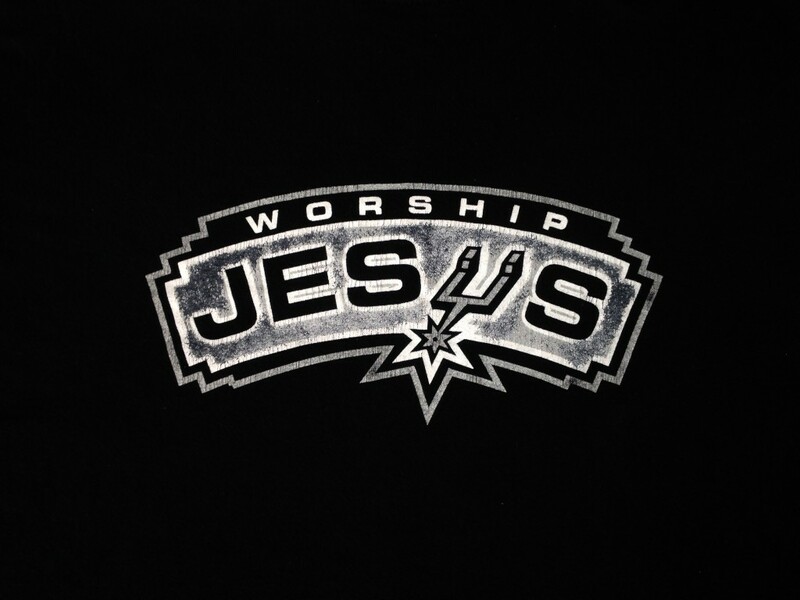 I am also a big San Antonio Spurs fan so when I found a t-shirt that combined two of my favorite things, well, you know I’m going to wear it. The problem is, I didn’t think about whom I was meeting with today when I dressed. I just put on a shirt and headed out the door. I was completely dumbfounded. What in the world is this crazy Witness looking at? This was my shirt. Yeah, BRILLIANT Keith, just brilliant. After he read it out loud, he then saw what the shirt actually says. That is when it hit me. I was wearing that shirt. JW: Worship… oh, yeah, yeah. I see it. I was very surprised that he started to laugh with me. JW: This is what logos can do, if you don’t take a closer look. You’ve got to read between the lines. KW: Yes, you always have to read between the lines. My Witness friend then started telling me about his weekend and we talked for nearly an hour about all kinds of things. This tells me two very important things. First, he is not pushy about his beliefs and is content to allow me to live according to the dictates of my own conscience. This is monumental. Most Jehovah’s Witnesses would have taken offense at the shirt immediately launched into an attack on the Deity of Christ attempting to prove that he was not worthy of worship because he is really just Michael the arch-angel. Second, the fact that he spent so much time talking about his life, family and their exploits from the weekend tells me that he is very comfortable with me and trusts me with some personal information. There were times when I was listening to him that I would have to pray for God to help me to let things happen naturally. I wanted to jump right into a discussion, but I knew it was important for him to be able to just talk. So talk, we did. We covered everything from rain to road rage. When we finally got into the Teach book, my Witness friend read the paragraph under consideration and then wanted me to check how the Revised New World Translation compares with the former New World Translation (NWT) on my iPad. The app is a wonderful tool for critics like myself to use. I can set it to use the RNWT and at the same time see the same verse in the NWT from their 1984 reference Bible, The Kingdom Interlinear Translation (KIT), the Byington, American Standard and King James Version. I was surprised they included the KIT. They never should have created the KIT. The KIT is a translation of the NWT which shows the Greek text and the word for word translation on one side of the page with the NWT on the other side of the page. The first one the Watchtower printed was in 1969 and the second one was in 1985. The Watchtower stopped printing them after that. I love it when a Witness uses one because I know where some of the problem spots are and I make sure they see those problems. I was able to show my Elder friend a number of places where the Greek did not agree with the NWT so he stopped bringing it with him to our studies. I think that is the reason why the Watchtower stopped printing them also. The Greek shows how their own translation is lacking in many areas. That being the case, I was shocked to see that they included it in their new app. Trust me, this will end up being a bigger mistake than printing the KIT in the first place. Now every Jehovah’s Witness with an Apple or Android device has the KIT in their pocket. I would not be surprised if they removed the KIT in a future update of the app. Somehow we got to talking about a bishop in the Catholic Church who built a 40 million dollar building in which he lives. There is supposedly a scandal about this man’s lavish lifestyle. My Witness friend was using this as an example to prove how the Churches of Christendom take advantage of people and are just in it for the money. Then he mentioned that this building was some sort of community center also. Whenever a Jehovah’s Witness criticizes something about Christians which I know the Watchtower is guilty of also, I like to agree with my Witness friend and then point to religions, or people groups outside of our discussion, which are guilty of the same thing. This way I can talk about the evils of the Watchtower without actually mentioning the Watchtower. I also address the criticisms used by the Watchtower which are also used by other groups. I will then address the examples of bad arguments of the other group and leave it up to the Holy Spirit to get the Jehovah’s Witness to connect the dots. As an example, I once had a couple of Mormon missionaries call our office asking if I would help them understand the Jehovah’s Witnesses because they kept running into them. They knew were a missionary outreach to both Jehovah’s Witnesses and Mormons so they wanted to see what we said about the Witnesses. We agreed to meet and I took them through a packet of information which details some of the false prophecies of the Watchtower. Through the whole meeting I never said one thing about Mormonism, but said things which would apply to any group which claimed to be a spokesman for God, yet had failed predictions. KW: I have an atheist friend who uses arguments against Christianity which are so hypocritical. He will complain that Christian churches will spend an inordinate amount of money on buildings instead of feeding the poor. I think it is really easy to pass judgment before first learning all the facts. If the building is being used for its intended purpose as a community center or whatever, then I don’t have a problem with that. JW: Tell me about Jimmy Swaggart. I told him what I knew about Swaggart’s ministry and his confession of being involved with a prostitute in the late 80’s. I remember that time because it was around the same time when I became a Christian. I didn’t tell my Witness friend this, but Jimmy Swaggart is one of the main reasons why Evidence Ministries does not solicit funds. I don’t believe it is a sin to do so, and will solicit funds if I believe God wants us to, but fund raising has always left a bad taste in my mouth because I remember being criticized by people I knew when I became a Christian and it was because of Jimmy swaggart and people like him. All they knew about Christianity was what was seen on TV. However, I did tell my Witness friend that a great portion of what is seen on TV is not real Christianity. I explained the “prosperity gospel” and how I do not believe it at all. KW: Guys like that drive me nuts. There are people who think that Christianity is only what they see on TV. I think it gives Christ a bad name. They think that everyone is like that and all they want is your money. I think people like Swaggart are conmen and all they want to do is make money. KW: If he is still doing ministry, I haven’t heard about it. I’m sure his following is nothing like what it once was. I took the opportunity to tell to my friend about other TV preachers who I believe are conmen. People like Robert Tilton, Creflo Dollar (aptly named) and Benny Hinn. KW: I can only watch these guys for about five minutes because I get so angry I have to change the channel. I watched one show where Creflo Dollar actually said that if you ask God for something and have enough faith, then God is obligated to give it to you. He used that word too, Obligated. Listen, God isn’t obligated to do anything for us. He isn’t some genie in a lamp waiting to be summoned by our faith. That is heresy. A lot of people you see on TV are not legitimate. At this point you may be wondering why I am agreeing with my Witness friend and giving him more reasons not to believe Christians. The reason is because I wanted him to understand that most who call themselves Christians are not like this. The majority of pastors in this nation are unable to live solely upon the offerings given in their local church. They take on other jobs and work loads of hours to support themselves and their families. I also used the example of men like Max Lucado who do not take salaries from their church because they make money from the books they write. That is admirable. I wanted my friend to see the whole spectrum and realize that not every Christian is like what is seen on TV. While all of the above is useful for him to know, here is where I made it applicable to my friend. I began talking about the followers of the conmen and how regardless of facts that are uncovered about their evils, the followers remain loyal. KW: The sad part though is that regardless of what evidence you have that these people are false prophets, these followers are committed. Those kinds of people, in my opining, are more committed to their religion than they are their God. That may sound strange to a lot of people, but there is a huge difference between the two. I have a friend who has a t-shirt which uses the mathematical symbol for “greater than” and then two words, “Jesus” on one side and “religion” on the other. It reads, “Jesus > Religion.” Regardless of which religious system it is, there are people who are more committed to the system than they are to Jesus Christ. People like that will do all manner of evil in the name of God because they feel like they have to give money to a ministry so that God will bless them. KW: People are hooked into that system thinking that their approval depends upon how they treat a certain religious organization. JW: (Eyes getting wider) Um-hum. KW: Like you said, the lady you knew ends up with nothing because she has her faith in the wrong place. JW: I think maybe she was mentally ill and it is hard to help someone who doesn’t want to be helped. JW: I always had the feeling that these people were taking advantage of her mental state. These religions induce fear and then take advantage of people. KW: It is. It is exploitation. It is using religion as a weapon to exploit people to get what you want. There are too many religions in this world that do that. JW: Speaking of spiritism, how do you feel about Halloween? KW: Halloween. That is a mixed bag. There are aspects of it that I think are fine and there are aspects that are not. I don’t have a problem with kids coming over to my house wanting candy. KW: I also don’t have a problem with my kids eating candy. KW: I also don’t have a problem with kids dressing up in costumes as long as they are not demonic or grotesque or anything like that. My daughter was a nerd last year. There are parts that are harmless, but not all Christians hold my view. Some believe that Halloween can only be evil. I don’t believe that. KW: (Pointing to his tie) For me, it is the same argument with your tie. Just because the origin of something may have been questionable, it doesn’t mean it has to take on the same meaning today. I am not celebrating what may have been the original intent and purpose. For the kids, it is all about the candy. Last year, we got 11 pounds of candy. JW: You don’t have any dentists in your family then do you? KW: (Laughing) No, but we do moderate their intake quite a bit. There are a lot of things about Halloween that I don’t like. Some of the movies that come out this time of the year are not cool, but when it comes to going over to someone’s house for candy, I really don’t see an issue with it. JW: I’m convinced that people do not have to dress up as something scary. JW: Some people look scary the way they are. We both laughed at that. I really do enjoy my Witness friend for things just like this joke. He isn’t too pushy and, even though he disagrees, he doesn’t give me a hard time about my choices in matters of conscience. Of course, I know he is being nice to me because I am not a Jehovah’s Witness, but still. Most Witnesses are not a gracious as my friend. I’ve found that for a deluded JW to even start to use critical thinking they first must be a victim of the JW unbiblical policies and procedures . Sometimes repeatedly . This is a pattern . a cunning scam . Not DFed . Keep up the good work . This is a very harmful hateful cult . Thanks! I agree with your assessment about being a victim of Watchtower policies. Unfortunately for Jehovah’s Witnesses, the Watchtower is faithful in its abuse of its own. CAN I HAVE PERMISSION TO USE THAT FOR A T SHIRT? Permission is not mine to give. You would have to find out who owns the property rights and I do not know who owns it. I’ve been puzzling over this for a while Keith. I cannot understand why he didn’t take your bait and start talking about how ‘the society’ is the way he connects with god/jesus and helps him understand the bible. He’s an elder right? He should have been more than happy to talk about his organisation, he still thinks you are his bible student so his mindset should be about trying to teach YOU. 1: he is starting to understand where you are coming from, and starting to realise he does not need the WT. I hope it’s either 1 or 3, cause that certainly will mean he’s starting to understand you. I think that is definitely part of it. I think he is leary of addressing certain topics. It may be that he thinks he can reach me with other topics and then address the ones he knows I hold strongly. Oh, I’m pretty sure he is starting to understand me. He is an interesting dude for sure. The way he asked the two random questions about Swaggart and Halloween, I think he really wanted to know what I thought instead of looking for a target to shoot at. I was surprised and pleased that he didn’t launch into attacking the idea that Jesus is worshiped. Keith, what is the name of the app you are using? The Watchtower released an app last week called, “JW Library.” It is purple with white lettering. You can find it for both Apple and Android devices. It is free. Hey Keith – Im not sure you could have worn a worse shirt! LOL, Glad all the time and energy you are pouring into your friends life is bearing some fruit. Stay after it – Ill keep praying Brother. Keith, where can I find these cool Christian t-shirts? I don’t think mine is available any more, but my friend’s shirt can be purchased here. relationship with Jesus is examined . when that time arrives because you’re building a friendship with him first . God bless you Keith . My wife and I are indeed praying for your Elder friend . That is so cool you can talk with a witness who wants information about how you see Christianity.